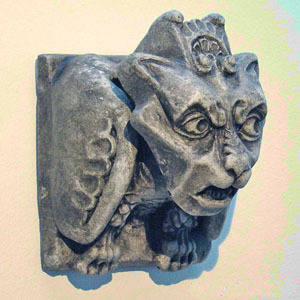 A super wall hanging hand crafted in Edinburgh; Bucky the gargoyle�s home was once an esteemed financial institution on Forrest Road, Edinburgh near the University, but over time it has been repurposed and now houses a popular coffee chain. He is a hybrid creature, known architecturally as a chimera, created from both bird and beast. He'll perch on your wall and watch over your belongings, keeping you safe from harm. All of the sculptures are hand-cast from Jesmonite, a strong yet lightweight architectural material which utilises actual stone to create a realistic texture and colour. The products are currently available in two finishes: Sandstone, a yellowish, heavily textured stone which replicates the majority of building stone here in Edinburgh, and Natural Stone, a pale grey, less textured stone. Each stone is given a patina of age. The casting and finishing process means that each piece is unique and may differ in slight details to the images shown above. Bucky measures approximately 13cms x 11cms.